Extreme Lateral Interbody Fusion (XLIF): interbody fusion procedure where spine is accessed from the patient’s side (laterally). 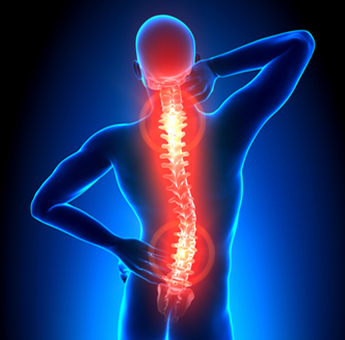 What is Spine Fusion Surgery? In fusion surgery (also called arthrodesis) two bones are fused together to form a single piece of bone tissue. When fusion surgery is done with vertebrae in the spine, the bones are fused together and the disc space between them no longer exists. Thus, two vertebrae are fused together to form a single, solid bone. A bone grafting material is used to stimulate the fusion process. The bone graft will be placed in the space between the two vertebrae (i.e., intervertebral disc space). There are a range of bone grafting materials that a surgeon can use. In essence, all lumbar spine (low back) interbody fusion procedures are identical. However, the manner in which a surgeon reaches the vertebrae of the spine can occur in several ways (called an approach). The most common surgical approaches for spine fusion procedures are anterior, posterior, transforaminal and lateral. There are advantages, disadvantages and limitations to each approach. Anterior approach: This procedure is called an ALIF (Anterior Lumbar Interbody Fusion). Here, the front portion of the spine is approached through the abdomen. Posterior approach: This procedure is called a PLIF (Posterior Lumbar Interbody Fusion). Here, the back portion of the spine is approached directly through the muscles of the lower back. Transforaminal approach: This procedure is called a TLIF (Transforaminal Lumbar Interbody Fusion). A TLIF procedure is highly similar to a PLIF procedure. Here, the back portion of the spine is approached directly through the muscles of the lower back but from only one side of spine and at an angle. Lateral approach: This procedure accesses the spine from the patient's side (laterally). There have been different names given to this technique including DLIF (Direct Lateral Interbody Fusion) and XLIF (eXtreme Lateral Interbody Fusion). What is Extreme Lateral Interbody Fusion (XLIF)? XLIF is simply a term given to an interbody fusion procedure where the spine is accessed from the patient's side (laterally). XLIF stands for eXtreme Lateral Interbody Fusion. Like any other surgical approach to the spine there are advantages, limitations and risks to an XLIF procedure. Who needs Extreme Lateral Interbody Fusion (XLIF)? Since XLIF is simply a lumbar fusion technique, anyone who requires a lumbar fusion could be a potential candidate for this procedure. More specifically, those individuals requiring fusion due to disc degeneration, failed fusion (pseudoarthrosis), degenerative scoliosis, spodylolisthesis, and a few other conditions. As with any approach, a patient may appear to be a candidate however their surgeon may not be able to perform the procedure for numerous reasons (including the need to have access to another area of the spine). What are the steps in Extreme Lateral Interbody Fusion (XLIF)? A lateral lumbar interbody fusion takes about an hour and is performed with the patient under anesthesia. The patient is placed on their side and two small incisions are made. The skin, muscles and other tissues are retracted (gently moved) to allow the surgeon access to the spine. The disc space is prepared by removing the disc tissue. Hardware and the bone graft are placed in the disc space. Hardware (surgical implants) serves to restore and retain the space between the vertebrae during the fusion process. The retracted tissues are released and the incision site sutured shut. After surgery, the patient is moved to a postoperative recovery area (PACU) for close monitoring of their vital signs. They will remain in the hospital for a period time; the duration of the postoperative stay can vary. After discharge, the patient will have several follow-up visits with their surgeon to assess their progress. The patient will also receive some physical therapy. The fusion process takes several months for the two bones to form a single, solid piece of bone; however, a patient's comfort levels often improve before the fusion is solid. Their surgeon will advise them when it is appropriate to resume their normal daily activities. Return to work will depend on the patient's postsurgical progress.